Well, to be honest, one of us is a boat person. Or, to be more precise, wants to be a boat person. That would be the hubs. He became the captain of his own one-boat fleet five years ago, and ever since, he and the kids have had a fairly good time about twice a summer, once the boat is unfettered by its trailer and me, the fun sucker of the family. Hey, someone has to do it. And I can’t get the memories of previous voyages out of my head. Trips such as this one, which I blogged about several summers ago. This summer, as usual, we took the boat to the northern Missouri lake we frequent infrequently. We generally make it there over Memorial Day weekend, when the rest of my extended family visits my parents’ farm in Brookfield. 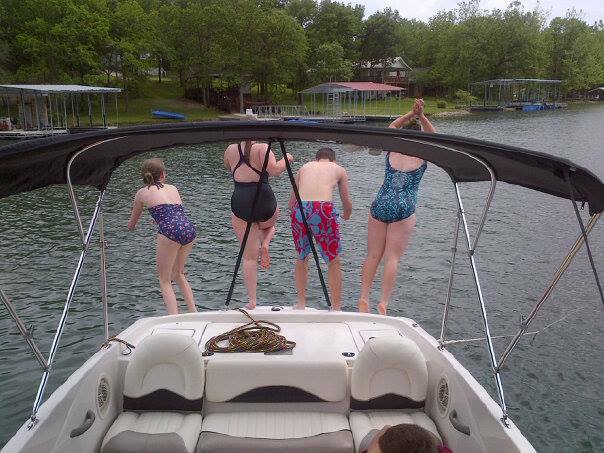 Last summer, we actually took the boat to Longview Lake for Joe’s birthday, taking him and some friends tubing. Putting the boat in the water there is a little stressful, what with the large numbers of other weekend water crafters waiting to plunk theirs in, too. For the life of me, I could not back the Suburban and boat trailer down the steep ramp, having instead to rely on one of Joe’s buddies, a 16-year-old boy, to back it down for me. 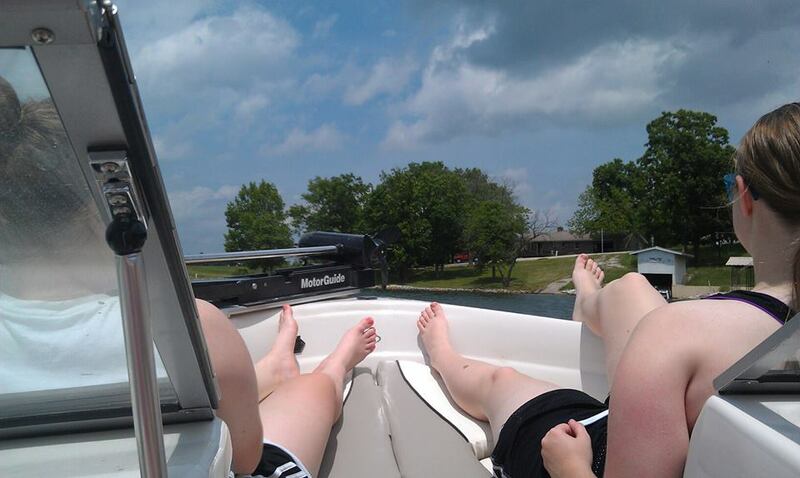 This year, though, when we made it to Lake Nehai we were looking practically like pros. We didn’t inflate the tube until we got to the little country store across the road from the boat ramp. While the hubs filled up the three-person tube, the kids and I went into the little store and bought sodas, snacks and two bags of ice at highly inflated prices. Finally, we were ready and headed for the boat ramp. Our timing was perfect – no one ahead of us, no one waiting. Matt backed the truck and trailer toward the water, put the Suburban in park and hopped out. He climbed into the boat and instructed me to back the trailer into the water. Like the good little boaters they are, the kids told me when we’d gone far enough. I turned off the trucked and hopped out, and Maggie and I unclipped the boat’s bow from the trailer. We pushed it a little and waited for it to set adrift. Matt turned on the motor and revved it a little, but the boat went nowhere. We were perplexed. What was going on? So I jumped back into the truck and pulled forward enough for him to unhook the back end. I had to pull it far enough out that backing it in was a doozy. It took me two or three tries and stops to remember that I had to turn the steering wheel the opposite direction of where I wanted the trailer to go. It was starting to feel like last year all over again. Eventually, the trailer made it back in to the water, we unhooked the bow, and Matt was off. While he and kids docked the boat and attached the tube, I parked the truck and trailer. Two of the kids decided to stay on shore and fish a while, so four kids and I joined Matt in the boat. Two of them hopped onto the tube, and away we went for a nice, leisurely jaunt around the little lake. 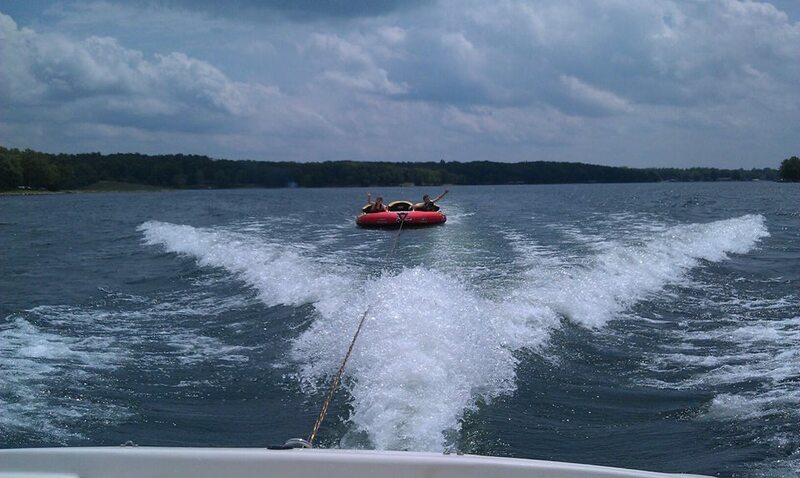 It was a glorious 30 minutes or so, and then Maggie and her BFF decided it was their turn in the tube. My niece stayed into, too, but Tom jumped back into the boat. He doesn’t weigh much, and with two teen agers in the tube, the boat had a hard time planing. Matt assured Tom we weren’t going to capsize, but he was scared. Petrified, really, as he huddled on the boat’s floor in the fetal position. I didn’t much like the ride, either, so I told Matt to take Tom and me to shore, where Joe and his cousin were finished fishing (nothing was biting) and could take our places in the boat. When we docked, Tom and I climbed out, and the two boys got in. Matt took off. Tom asked for the keys to the Suburban; he thought he’d left his iPod in there. I gave him the keys with a stern warning: Don’t lock them in the truck. The other set was in the Suburban in my purse. He headed up the hill, and I sat down on the dock to sunbathe. Pretty soon a pontoon boat full of fairly inebriated folks headed toward the dock. Most of the five occupants disembarked to use the portable toilet near the boat ramp. We chatted amiably about whether a storm was brewing as dark clouds gathered to the north of the lake. Then they left. And I waited. And I realized that Tom had been gone a long time. The city girl in me wondered if he’d been kidnapped, but the more practical maternal side had another foreboding thought. I took off up the hill. When I reached the Suburban, I found Tom with a stick in his hand, trying to pick the lock on the driver’s door. He hung his head and told me he’d locked the keys in the car. He’d been in the back and thought he saw a ginormous spider, so he jumped out and slammed the door shut, leaving the keys and forgetting that he’d already hit “lock” on the key fob so he wouldn’t forget to lock the truck when he left. Tears stained his dirty little face. I just sighed. Was I surprised? Not in the least. I headed to the guardhouse to see if they had a phonebook. For once, I gave thanks for my mobile phone. Eventually, I reached AAA Missouri, who promised me a) Tom wasn’t the first kid to try to pick a car lock with a stick and b) a guy with a Slim Jim would be there in 30 minutes to two hours. It was more like 90 minutes by the time the country mechanic from Meadville, a town about 45 miles away, made it to the lake. He had the Suburban unlocked in about 20 seconds. I thanked him profusely and headed back to the dock to wait. Eventually, the boat returned, and the kids said they were bushed and ready to head back to the farm. I’d been on the water all of 30 minutes the whole day. But the Captain was happy, and his little crew of kids and cousins was worn out. And I guess that’s about all you can ask for when you’re a weekend warrior. you should build some quality backlinks , it will help you to get more visitors.